The LGT, VGT and FGTR products are moderate- to high-load capacity girder tiedowns for new or retrofit applications. LGT connectors provide a low-profile connection to the wall for easy installation of drywall. Simple to install and can be installed on the inside or outside of the wall. The VGT variable girder tiedown is a higher-capacity alternative to the LGT and MGT for girder trusses. It attaches with Strong-Drive® SDS Heavy-Duty Connector screws to the side of truss and features a predeflected crescent washer that allows it to accommodate top chord pitches up to 8/12. The VGT is also available with one flange concealed for attachment to trusses with no tail. The FGTR face-mount girder tiedown is a non-pitch specific girder tiedown that offers the highest uplift capacity for retrofit applications. The FGTRHL/R is designed for corner hip applications. Connectors attached using Titen® 2 screws shall have hex heads. To achieve the loads listed in the table below, the product shall be attached to a grouted and reinforced block wall or a reinforced concrete wall designed by others to transfer the high concentrated uplift loads to the foundation. Strong-Drive SDS Heavy-Duty Connector screws included with LGT3, LGT4, VGT series and FGTR series. Screw holes are configured to allow for double installation on a two-ply (minimum) truss. The product can be installed in a single application or in pairs to achieve a higher uplift capacity. Can be installed on roof pitches up to 8/12 or on a bottom chord designed to transfer the loads. FGTR — only two of the four holes provided on each strap are required to be filled to achieve the published loads. The first Titen HD® anchor 1/2" x 5" (THD) shall be installed a minimum of 4" from the top of the wall. Anchors shall not be installed in adjacent holes. VGT — when installed on trusses with no overhangs, specify VGTR/L. VGT — install washer component (provided) so that top of washer is horizontal as well as parallel with top of wall. To achieve the loads listed for the VGT single- and double-connector options, anchorage into a 8" wide concrete tie-beam or grouted and reinforced CMU tie-beam can be made using SET XP® anchoring adhesive with a minimum embedment depth of 12", with a minimum end distance of 12", and centered in the 8" member. Vertical reinforcement may be required to transfer the loads per Designer. FGTR — minimum edge distance for Titen HD® anchor is 4". FGTR — Titen HD® anchors should be spaced in every other hole on the part. FGTR — Titen HD® anchors and Strong-Drive® SDS Heavy-Duty Connector screws are provided with the part. LGT2 — F1 load = 700 lb. ; F2 load = 170 lb. ; LGT3 — F1 load = 795 lb. ; F2 load = 385 lb. ; LGT4 — F1 load = 2,000 lb. ; F2 load = 675 lb. Products shall be installed such that Titen 2 screws and non-stainless Titen HD anchors are not exposed to the weather. For concrete wall applications, use 1/4" x 1 3/4" Titen® 2 screws. 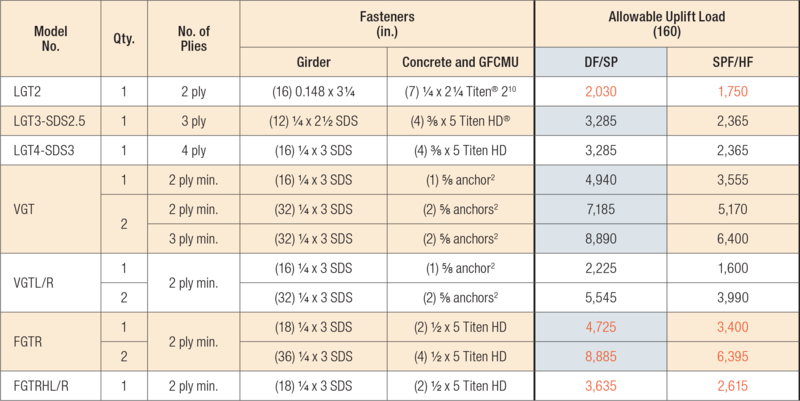 Fasteners: Nail dimensions in the table are diameter by length. SDS screws are Simpson Strong-Tie® Strong-Drive® screws. For additional information, see Fastener Types and Sizes Specified for Simpson Strong-Tie Connectors. LGT See specific model numbers for code listings.